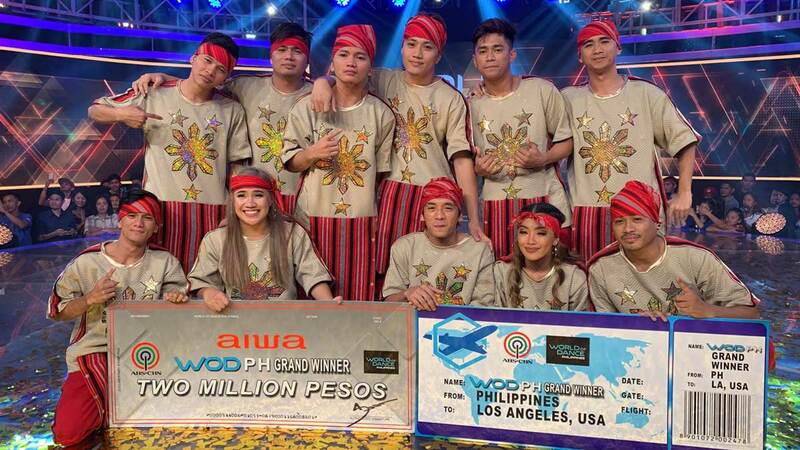 FCPC Baliktanaw bags title of first World Dance Philippines champion. FCPC Baliktanaw is the first World of Dance Philippines champion. With an average total of 99.05, the team division finalist will be representing the Philippines in the World of Dance U.S.A. The Bulacan-based dance crew wins a qualifier slot in World of Dance U.S.A. The members also win the jackpot prize of PHP2 million. FCPC Baliktanaw is known for its choreography featuring OPM songs. At the grand finals, the group chose to perform to the song of the late rapper Francis M, "Man From Manila." Maja said, "Yan yung tinatawag na swag. Yung swag ng Pinoy nasa inyo talaga. Alam niyo, kung man kayo dumating, ay, magiging sobrang proud ako sa inyo." Gary added, "Hanep! Hanap talaga! Congratulations!" As for Billy, the group's mentor, the Kapamilya host-performer was simply full of emotions. Duo Luka and Jenalyn took the second spot with an average total of 96.38, while juniors division finalist Ken San Jose capped his World of Dance Philippines journey with 94.93. FCPC Baliktanaw was named as the first World of Dance Philippines champion during the show's live World Finals episode aired on Sunday night, April 7.